If you’re looking for a mindmapping tool for your Android phone, consider Thinking Space. 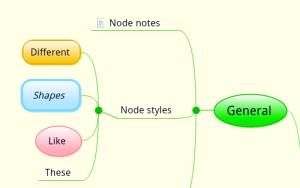 Using tools provided by the app, it’s easy to create mindmap nodes in a variety of styles. Double tapping a node provides you with access to options for that node. Tap on each option (e.g., Text, Node, Tools) to access more features. If you prefer using gestures, tap the Gesture Spot icon. 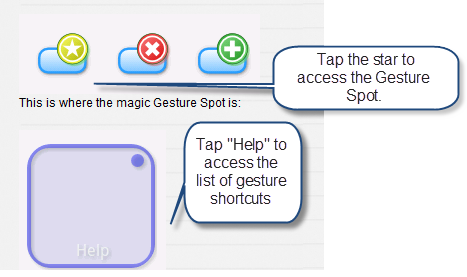 By drawing in the Gesture Spot and tapping the circle on the right hand corner of the spot, you can perform a variety of actions. Not sure what gestures you can use? Just tap help to access the menu. A portion of the menu is shown below. Though only available with the Pro feature (which costs just under $5), you can associate different file types with nodes, including voice recordings. 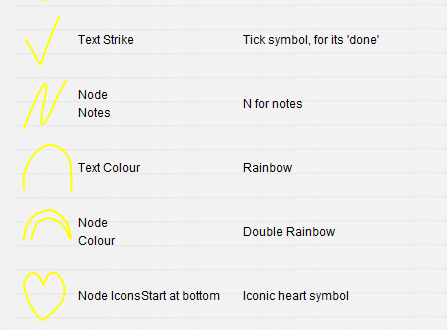 However, even with the free version, you can associate notes with your nodes. You can also sync Thinking Space files with your PC via Dropbox. Thinking Space is a power tool so you’ll need to play around with its many features. You can learn more about Thinking Space here. The ability to use a mobile device to perform mindmapping means you have much more flexibility about when and where you can brainstorm, collect, and connect ideas.